This production was the debut performance of a new English translation by SOS members, Mike Pavitt and April Luescher. This translation is copyrighted to SOS but is available on application. Past experiences show that any production of Carmen will be a traumatic affair, involving considerable upheaval, upset members and the chances are that the Chairman will resign soon after. In 2011, the set backs started early as Albie Minns, who had agreed to direct the show, was let down in a Maskers’ production and, for a while, ‘lost his love for amateur theatre’. However, Shaun Dodimead, who was going to direct EOMS’s cancelled production, agreed to take over, whilst Nigel Finch even joined the chorus of a professional production in readiness to be the MD. 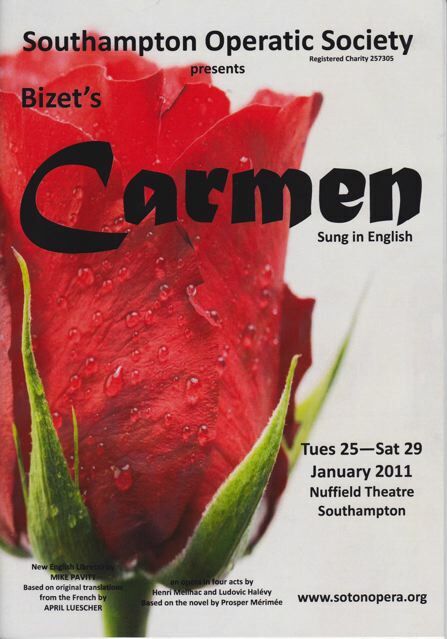 It was felt that the standard translation of Carmen was sub-standard, so two members, April Luescher and Mike Pavitt, set about rectifying the problem. April translated the libretto from the original French and then Mike rearranged the words to fit the music – a Herculean task that he had hoped to complete in the summer but was then distracted by having to play the King in Utopia, Limited. Consequently, he worked to complete a song in time for the next rehearsal but the company would then have to start by writing the new version into their scores, all of which took up valuable time. As anticipated, the auditions were contentious. Carmen attracted several new members and they were mostly successful in gaining the lead roles - never a popular outcome. Lilya Cherpokova played Carmen, she possessed a remarkable voice but her stage experience was limited to singing with a heavy metal band. She also had a strong Bulgarian accent and a cavalier approach to stage directions; verdicts of her portrayal of the character ranged from ‘perfect’ to ‘terrible’, depending on whether a raunchy Carmen appealed or not. The auditions’ panel did not find a suitable Don José amongst the candidates and eventually turned to a past member, Simon Pontin, who had since become a professional, and he was breathtakingly good! Even though the directing team belatedly insisted that a matinee would strain the voices of the principals too much, Carmen still achieved a healthy profit of £1740.